The New Home Construction Bid Sheet helps homeowners in planning, estimating costs, and hiring the right general contractor in the building of a new custom home. Monday, July 21, 2008: Derry, New Hampshire – HomeAdditionPlus.com introduces its New Home Construction Bid Sheet. The New Home Construction Bid Sheet provides homeowners with the knowledge on how to plan a custom home building project, and how to hire the right general contractor for their new home construction project. It also includes a separate cost breakdown spreadsheet that homeowners can modify for their specific home construction project costs. The New Home Construction Bid Sheet from HomeAdditionPlus.com (http://homeadditionplus.com) is ideal for homeowners who are planning to have a custom home built. The Bid Sheet is specifically designed to help homeowners in the soliciting of bid proposals from general contractors on the construction of new custom homes. The 30 page, New Home Construction Bid Sheet includes a request for proposal (RFP) form that homeowners submit to prospective general contractors for them to complete and provide back to the homeowner for review. The RFP form consists of over 170 questions on all aspects of the construction of the custom home. In addition, the New Home Construction Bid Sheet provides extensive and important advice to the homeowner on how to work with a general home contractor and his sub-contractors in order to ensure the custom home is built to the satisfaction of the homeowner. It also provides an extensive list of manufacturers for key building products for the custom home. Budget Allocations for Flooring, Appliances, etc. The New Home Construction Bid sheet also provides estimated home building costs and time intervals for each phase of the home building project, as well as a spreadsheet form for entering your own home construction costs. The New Home Construction Bid Sheet is priced at $19 and can be purchased on line at New Home Construction Bid Sheet and is immediately downloadable. 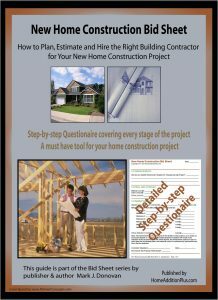 For more help on building a custom home or home addition, see HomeAdditionPlus.com’s Home Addition Bid Sheets. Our Home Addition Bid Sheets provide you with the knowledge and information on how to plan a home building project, and what to look for when hiring contractors. They also include detailed cost breakdown tables and spreadsheets for estimating your own new home construction building costs.